After winning three of its first four Big Ten games, Tuesday’s trip to Columbus was supposed to be an opportunity for Michigan to prove how much it has improved since December. Instead, it was a harsh reminder of just how far the Wolverines have to go. Michigan came out firing and took a 14-13 lead eight minutes into the game, then — as has happened to varying degrees in almost every game this season – the wheels fell off. The Wolverines turned the ball over eight times in the first half and after making five of their first seven shots, only connected on five of their final 20 attempts in the first half. This wasn’t about a raucous crowd or a great atmosphere – Michigan players discussed the eerie silence of Value City Arena, not the intimidating crowd – it was about a team that didn’t have the discipline, talent or cohesiveness to challenge the Buckeyes on their home floor. Ohio State is no slouch, and will be a contender in the Big ten, but this was yet another dreadful offensive performance by a Michigan team that’s starting to make a habit of dreadful offensive performances. Michigan’s offense managed just .83 points per trip, gave the ball away on a fifth of its possessions and didn’t shoot a free throw until there were four minutes to play in the second half. John Beilein discussed how Michigan coaches and players would look for small victories to take from Tuesday’s blowout loss, but overall there was very little positive to take from this offensive performance. The Wolverines fired around lazy passes and were unable to generate anything at the rim (42%) on twos, while only making six of the 26 threes they fired up. Defensively, Michigan was ran out of the gym. The Buckeyes finished with a scoring output of 1.13 points per trip — Michigan’s third worst defensive performance of the season — but it easily could have been much worse. The most disappointing element of Michigan’s defensive effort was its inability to stop Ohio State’s transition offense. I wrote in the preview that the Buckeyes pushed the ball harder than anyone in the league, and Michigan learned that the hard way. 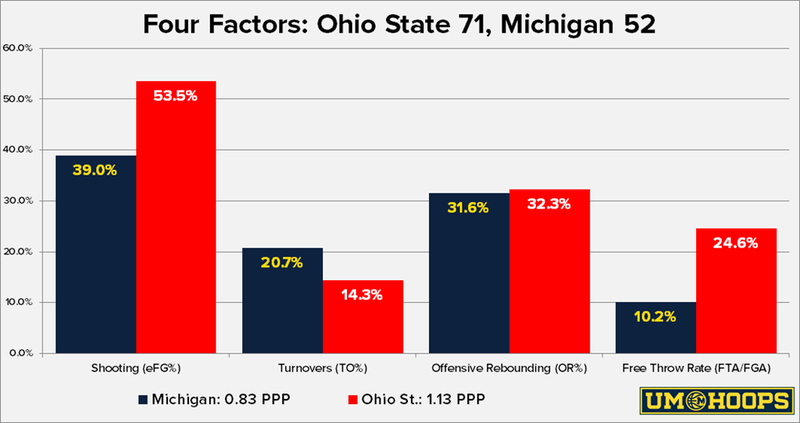 Ohio State outscored Michigan 19-2 in transition and many of them were painfully easy whether it was a big man running the floor past the entire Wolverine defense or no one picking up wide open shooters and drivers. Late in the game Michigan gave up some easy offense due excessive trapping to try to get back into the game, but the early easy baskets were the most damning because they were no surprise — everyone knew what was coming. The Buckeyes also dominated the offensive glass in the first half, rebounding 44% of their misses in the first 20 minutes and outscoring Michigan 10-2 in second chance opportunities. Six different Buckeyes grabbed at least one offensive rebound in the first half as the Wolverines simply couldn’t box out or win 50-50 balls. Despite the rough first half, the most disappointing stretch was the first seven and a half minutes of the second half. Michigan was awful in the first half, but had a chance to respond with anything positive immediately out of the halftime break. Instead, the Wolverines missed 11 straight shots and turned the ball over three times as Ohio State stretched its lead to 28 points. John Beilein’s only option was to yank his leading scorers, Caris LeVert and Zak Irvin, to send a message. The message was finally received as Michigan went on an 8-0 run, but the embarrassment was complete. The biggest question after tonight is where is this team’s leadership and backbone. Beilein has discussed the importance of ‘energy givers’ on a roster — players that provide positive energy during tough times or after bad plays — and right it’s tough to find any on this roster. No one stepped up when the team “lacked energy” in the first half, and no one stepped up to start the second half. This is a major punch in the gut for a Michigan team trying to build momentum, but so was an 18 point second half at Purdue. The Wolverines need to bounce back and have winnable games against Northwestern and Rutgers next on the schedule. Derrick Walton: Beilein blamed Walton’s second foul for throwing Michigan’s offense and defense off in the first half, but Walton also struggled from the floor and finished 1 of 7 from the floor. All of Michigan’s guards struggled to find the roll man in the ball screen game before Ohio State’s big men could recover. Caris LeVert: LeVert finished with a team high 14 points, but he was 4 of 10 from the floor and had just one assist to three turnovers. LeVert is always going to be able to get his, but he struggled to deal with Sam Thompson’s on-ball defense overall. The Buckeyes generally forced LeVert where they wanted to in the ball screen game and like Walton, he was unable to pass out of the pick-and-roll without turning it over. Spike Albrecht: Albrecht had 0 assists to 1 turnover, one of the first marking the first time he hadn’t record an assist since Michigan’s loss to Kentucky last March. This is a tough matchup for Albrecht given Ohio State’s perimeter quickness, but the Wolverines need him to produce. Zak Irvin: Irvin scored eight points on three shots in the first six minutes of the game, but the other 24 minutes that he was on the floor were incredibly disappointing. From there on out he was 1 of 7 from the floor and with four turnovers. Irvin’s passing was painful to watch (4 turnovers) and the rest of his game slipped quickly once the shots stopped falling. Ricky Doyle: Doyle had a tough time keeping up with Ohio State in transition and finally had a subpar game finishing around the basket (1 of 4 from the floor). Beilein praised Amir Williams’ ability to protect the rim (3 blocks) and he definitely seemed to impact Doyle in that regard. Mark Donnal: Donnal showed a few flashes today, but also had plenty of mistakes. It was nice to see him rebound in the second half with a couple of nice finishes. He continues to shoot the long jumper, but he’s not having much luck with it. Kameron Chatman: Chatman was 0 of 4 from the floor, but did grab three rebounds and hand out two assists in 14 minutes. He’s now playing about the same number of minutes as Aubrey Dawkins and Muhammad Ali Abdur-Rahkman and frankly hasn’t done much to prove that he deserves more. Aubrey Dawkins: Dawkins shot looked very flat (and long) today, but he did come up with a putback in the first half and knocked down a nice midrange jumper in the second. Defensively, he seemed to get lost a few times in the zone boxing out which led to a couple of Ohio State’s second chances. Muhammad Ali Abdur-Rahkman: Abdur-Rahkman was 1 of 6 from the floor (1-5 3pt) and was only credited with one turnover, but he was really thrown into a tough spot in the first half. He’s not ready to face the sort of pressure that Ohio State can apply to a guard – to put it into perspective, Trey Burke was barely ready to face that pressure as a freshman – and he struggled with Walton on the bench with two fouls.